Features fun music, gentle vibrations, and comfortable seat insert for your little one. Suitable for newborn to 12 months. Maximum weight 25 lb. Extra-comfy plush insert makes it easy for your baby to get cozy. Bright colors, fun music, and playful overhead lights help stimulate your baby's visual and auditory senses and encourage eye-tracking. 3-point adjustable harness 1-speed soothing vibration. Removable toy bar with 1 "band" toys offer bat-at fun, alongside removable toy rattle for take-along play. 100% polyester plush lining. Measures 25.2" L x 21.26" W x 22.05" H. Requires 3 C batteries (sold separately). Imported. 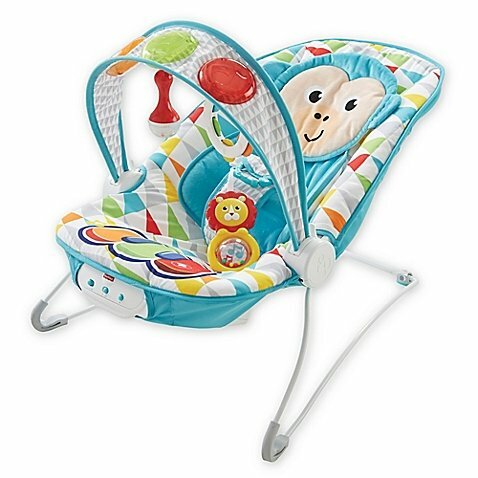 The cozy Deluxe Kick 'n Play Musical Bouncer from Fisher-Price makes it easy for your little one to rest and play with both gentle vibrations and bright colors and music. Its sensory toy canopy adds fun, while the plush seat makes for a soothing space.